This dialog is opened by clicking on Paste Special… in The Edit Menu. This option is only available if an object has been copied to the clipboard before. 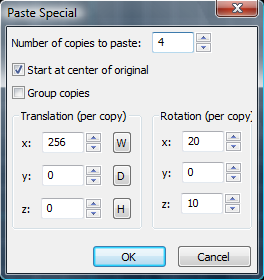 Paste Special allows you to paste more than one copy of a selection into the map. You can for example paste a row of the same object into the map, whereat the object is pasted multiple times and each copy is shifted in position to form a row with the other objects. Number of copies to paste: The number of copies from the objects in the clipboard that will be pasted. Start at center of original: If this is activated, pasting starts at the center of the original object/s. Otherwise it starts at the center of the last two selected 2D views. Group copies: Objects are combined into a group after pasting them. Translation (per copy): Sets the offset in x/y/z direction of each pasted object. This offset is accumulative, so the offset of an object is its own offset and the sum of the offsets off all previous objects. Rotation (per copy): Sets the rotation offset of each pasted object. This offset is accumulative, so the offset of an object is its own offset and the sum of the offsets off all previous objects.